Landscape-wide contamination created by nuclear disasters provides a setting to investigate variation across across species in their exposure, sensitivity, and response to nuclear contamination. I analyze the consequences of the the nuclear disasters of Chernobyl and Fukushima at different levels of biological organization: on the physiology, behavior and life history of a variety of organisms, including birds, mammals and insects. In Chernobyl and Fukushima, in collaboration with Tim Mousseau, Anders Møller and several other researchers, I use a combination of fieldwork observations and laboratory assays to investigate the effects of radioactive contamination at different levels: at the individual level, at the population level, as well as at the level of communities. The environmental effects of the Deepwater Horizon oil spill. The Deepwater Horizon (DWH) oil spill is the largest accidental oil spill in history, and one of the worst environmental disasters in the history of the United States. 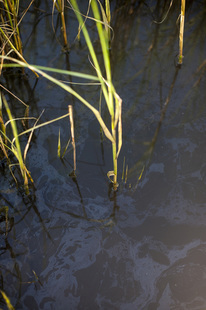 Our lab researches the ecological and environmental effects of the DWH oil on organisms living in the marshes of southern Louisiana, from molecular to life history effects. After demonstrating that oil from the spill was incorporated in the tissues of seaside sparrows (Ammospiza maritima), we are now analyzing their physiological and transcriptomic responses. My studies in this area lie at the interface between parental strategies of resource allocation to the offspring, and the offspring's development and competition for those resources. Most of my work in this area is conducted on birds, through the experimental manipulation of egg quality (in terms of nutrients and hormones), as well as through the manipulation of offspring competitive environment. I am also interested in the life history trade-offs that shape maternal strategies of contribution to the eggs, and the physiological currency underlying these trade-offs.